Ata Permana: Brother made me a breakfast! 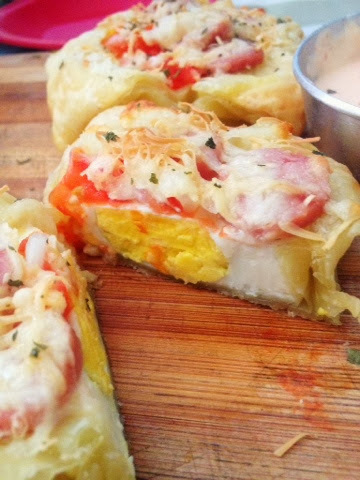 He made us..ummm, we didn't know the name; but my mama called it "egg cheese puff pastry". Whatever it was, it was so delicous and I never thought that he could have this idea. 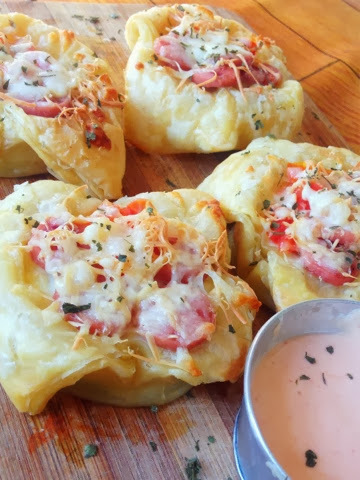 Inside of the puff pastry bowl, there were egg, tomato, sausage, and cheese; with seasonings, indeed. We ate with mayo and chili sauce, just that. Honestly it was sooooo goood! Finally, my brother can cook for me..happy!